More info:From £1899 - £1999 excluding flights. Prices based on 2 adults sharing. Single supplement available. Mimimum age 14. Many travellers find that often the most valuable insights into a country’s culture come not from its best-known cities and landmarks, but from exploring the gaps between them. That’s exactly what this China small group tour sets out to do, and if you take the time to read through the detailed itinerary, you’re bound to find it very tempting. Travel on a shoestring, using public transport and staying in locally owned accommodations, for an authentic cultural immersion that most trips cannot offer. Naturally, no tour of China would be complete without admiring the ‘big ticket’ sights. In Beijing you’ll have the chance to roam the spectacular Forbidden Palace and Tiananmen Square, and there will also be a day-trip out for a walk on a section of the Great Wall of China – a bucket list experience for many people. After an overnight train to Xian, you can also see the legendary Terracotta Army, and take part in a traditional tea ceremony. 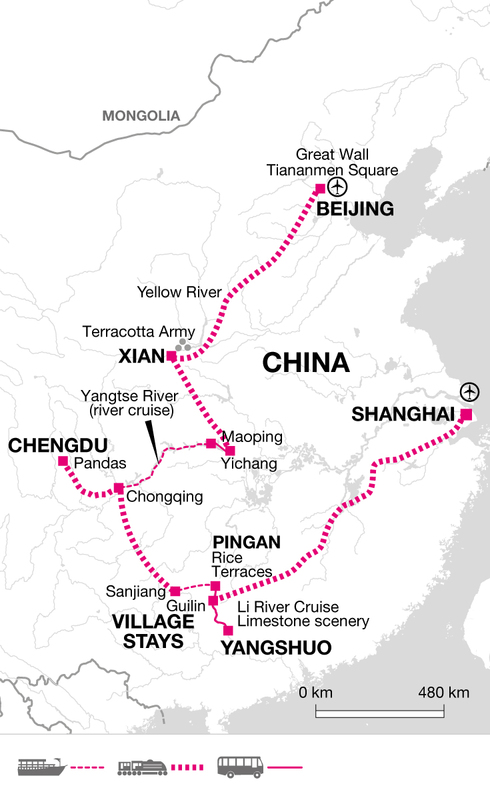 But then the tour departs from your more standard China itineraries. First, you’ll embark on a stunning four-night cruise along the Yangtze River, one that takes you through some of China’s most bewitching scenery including the Three Gorges, and the haunting ghost town of Fengdu which was abandoned due to the nearby dam project. Disembarking you’ll take the bullet train to Chengdu, capital of the Sichuan province, where it is thought the southern Silk Road first began and where you will also take an unforgettable tour of the Panda Research Centre. You’ll follow this with several days spent in picturesque border-country, trekking, staying in rural villages, eating delicious homecooked meals and indulging in a rich variety of cultural encounters. You might hire bikes to cycle through quiet country lanes and rice paddies, barter in local markets, or even take a cookery class. The trip continues to Shanghai, a world apart from the countryside and a city where past and present blend seamlessly – there's no more fitting place to end the tour. Meeting the people is often a great highlight of a tour and our leaders are real facilitators; enabling us to meet and mix with local people wherever possible – all the more fun when we are travelling off the beaten track. Our local leaders take us to small, locally owned and run restuarants wherever possible throughout the trip, ensuring that small businesses benefit from our visit, and that we enjoy a very authentic experience. Hi Dominic thank you for reviewing your holiday and great to hear that you enjoyed the trip and have some good memories to bring home with you. With regards to the environment it is a problem in China and as you have pointed out there is too much plastic waste. From our perspective we try to assist the environment through measures such as using public transport - particularly trains and boats which cuts down on the carbon emissions that would be generated from private vehicles but we are fully aware of the issue with plastics and are working with our local agents to try to reduce this where we can. It is a long haul however! As a company we are very involved with the whole issue of plastic waste and have introduced such initiatives as Water to Go to help reduce the amount of plastic bottles used on trips. Many thanks again for your valuable comments.